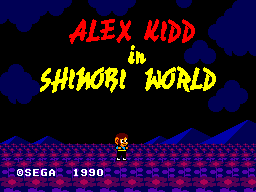 Alex Kidd in Shinobi World: two of Sega's greatest franchises mixed together and also Alex Kidd's last ever game. He has made cameos in future games but this game is the last game to feature him as the main character until Sega decided to swap him out with a blue blur. So does the former mascot get fired in style? Or does he go out in shame? Let's find out. 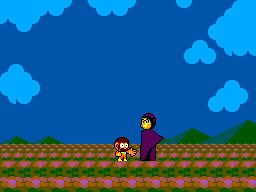 The Dark Ninja has returned to take over Miracle World and in doing so he has kidnapped Alex Kidd's girlfriend. Another ninja appears and gives Alex powers to go stop the Dark Ninja and save his girlfriend. Got that? 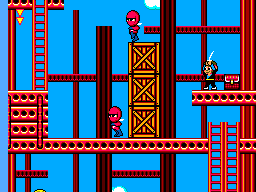 It has Shinobi-type gameplay, so it adds something to what could have been just another Alex Kidd game. The graphics are basically what you would expect from an Alex Kidd game. It has a sort of chibi style and I will say that it works well with 8-bit but some parts could be better and will make you say "huh, that's all?" a lot. The music in the game is okay, not the best gaming music I've heard but music I think people would hum along to. Button 1 attacks and is usually always on time when you press the button. Button 2 jumps but at times I will press 2 and he will not jump. This happens very rarely though but has caused a few lives to be taken off of me at unfair times. The game is quite hard so if you don't play it for a few hours it's harder to adapt to it. You'll replay it to obviously try to win but mostly you will probably finish it in a few hours then a few days later go "That Alex Kidd game was actually pretty good" and pick this up, put it in and play. And it's also good for killing time. This is a very good game for the Sega Master System and definitely a good game to end the Alex Kidd series with. It will make you feel really good when you beat it and it might make you a bit sad when remembering it's the last Alex Kidd game. Anyone who gets a Sega Master System should definitely pick this one up as it is a must-have and it's just a really great game.